ANY MACHINE, WHICH PRODUCES POWER, IS CALLED AN ENGINE. ANY ENGINE, WHICH PRODUCES POWER OR WORK FROM A SUPPLY OF HEAT, IS CALLED HEAT ENGINE.THE HEAT CAN BE SUPPLIED BY BURNING, I.E. BY COMBUSTION OF FUEL. AN EXTERNAL COMBUSTION ENGINE, E.G. STEAM ENGINE, STEAM TURBINE, ETC. IN THIS TYPE OF ENGINE, THE HEAT OF THE COMPRESSED AIR ITSELF IGNITES THE FUEL. NO OTHER MEANS OF IGNITION ARE REQUIRED, E.G. DIESEL ENGINE. 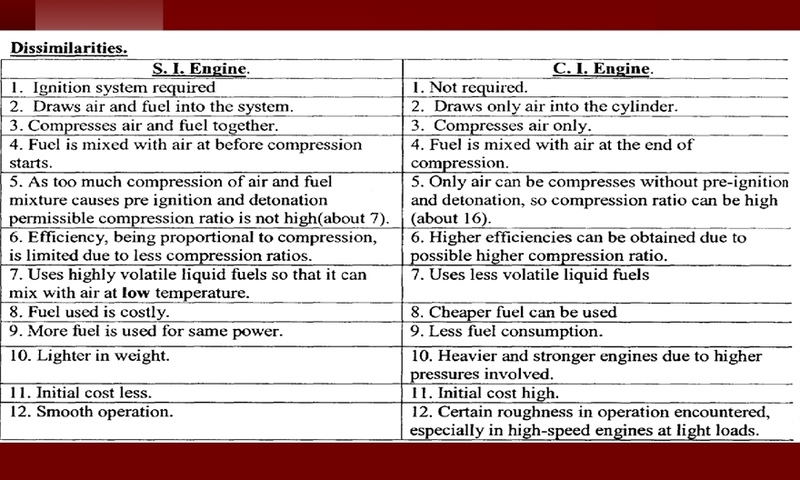 IN A COMPRESSION IGNITION ENGINE, E.G. DIESEL ENGINE, A PISTON RECIPROCATES IN A CYLINDER. AT DOWNWARD STROKE OF PISTON, AIR ENTERS THE CYLINDER. AT UPWARD STROKE OF PISTON AIR IS COMPRESSED. DUE TO COMPRESSION PRESSURE AND TEMPERATURE OF AIR BECOMES QUITE HIGH (OVER 35 BAR AND 500*C RESPECTIVELY). FINELY ATOMISED FUEL OILS SPRAYED INTO SUCH COMPRESSED AIR IGNITE SPONTANEOUSLY AND PRODUCE POWER. VAPOURISES THE GASOLINE. 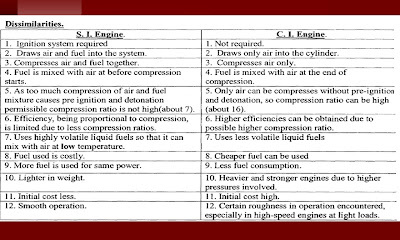 PROPORTIONATE MIXING OF AIR AND GASOLINE VAPOUR IS DONE IN CARBURETOR. MIXTURE ENTERS THE CYLINDER WHERE AT A SUITABLE TIME, AN ELECTRIC SPARK IGNITES THE MIXTURE, WHICH BURNS THEN QUICKLY AND PRODUCES POWER. IT IS THE IDEAL AIR STANDARD CYCLE FOR PETROL ENGINE, THE GAS ENGINE AND THE HIGH-SPEED OIL ENGINE. THE ENGINES BASED ON THIS CYCLE HAVE HIGH THERMAL EFFICIENCY BUT NOISINESS RESULTS PARTICULARLY AT HIGHER POWER DUE TO HIGHER PRESSURES IN THE CYLINDERS. = 1-(1/R) ϒ−1 , R = COMP. RATIO. IT IS THE IDEAL AIR STANDARD CYCLE FOR DIESEL ENGINE, ESPECIALLY SUITABLE FOR LOW SPEED DIESEL ENGINE BUT NOT FOR HIGH SPEED DIESEL ENGINE. THE THERMAL EFFICIENCY IS LOWER THAN OTTO CYCLE ENGINES BUT ENGINES RUN SMOOTHLY DUE TO LOWER PRESSURES IN THE CYLINDER. MODERN DIESEL ENGINES DO NOT OPERATE PURELY ON CONSTANT PRESSURE COMBUSTION CYCLE BUT SOME PART OF COMBUSTION PROCESS TAKES PLACE AT CONSTANT VOLUME WHILE THE REST IS COMPLETED AT CONSTANT PRESSURE. 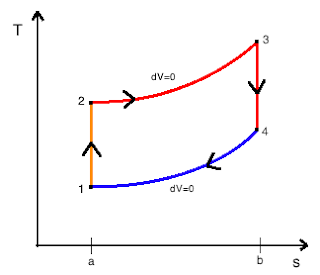 IN GENERAL, THIS CYCLE RESEMBLES CONSTANT VOLUME COMBUSTION CYCLE MORE THAN CONSTANT PRESSURE COMBUSTION CYCLE. IT IS SUITABLE FOR MODERN MEDIUM AND HIGH SPEED DIESEL ENGINES. 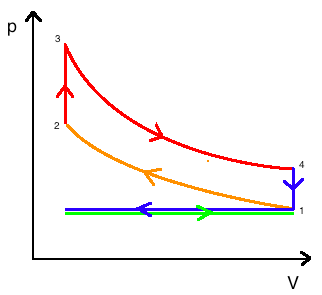 THE THERMAL EFFICIENCY IS MORE THAN DIESEL CYCLE BUT LESS THAN OTTO CYCLE. ALSO NOISE LEVEL IS IN BETWEEN THE TWO. THIS IS A MORE PRACTICAL ENGINE. Ø HEAT ADDED PARTLY AT CONSTANT VOLUME AND PARTLY AT CONSTANT PRESSURE. HENCE HAVING ADVANTAGES OF BOTH CYCLES. Ø FILLING THE ENGINE CYLINDER WITH FRESH AIR. Ø COMPRESSING THE AIR SO MUCH THAT INJECTED FUEL IGNITED READILY BY COMING IN CONTACT WITH HOT AIR AND BURNS EFFICIENTLY. Ø EXPANSION OF HOT GASES. Ø EMPTYING THE PRODUCTS OF COMBUSTION FROM THE CYLINDER. AN ENGINE, WHICH NEEDS 4 STROKES OF THE PISTON (2 IN AND 2 OUT) TO COMPLETE ONE CYCLE, IS CALLED FOUR-STROKE ENGINE. AN ENGINE THAT NEEDS ONLY 2 STROKES OF THE PISTON (1 IN AND 1 OUT) TO COMPLETE ONE CYCLE IS CALLED TWO-STROKE ENGINE. THE PISTON IS CONNECTED DIRECTLY TO THE UPPER END OF THE CONNECTING ROD. A HORIZONTAL PIN (GUDGEON PIN) WITHIN PISTON IS ENCIRCLED BY THE UPPER END OF THE CONNECTING ROD. THIS CONSTRUCTION IS QUITE COMMON, ESPECIALLY IN SMALL AND MEDIUM SIZE ENGINES. 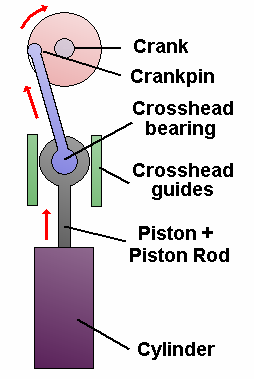 THE PISTON FASTENS TO A VERTICAL PISTON ROD WHOSE LOWER END IS ATTACHED TO A ‘CROSS HEAD’, WHICH SLIDES UP AND DOWN IN GUIDES. THE CROSSHEAD CARRIES A CROSSHEAD PIN, WHICH IS ENCIRCLED BY THE UPPER END OF THE CONNECTING ROD. THIS MORE COMPLICATED CONSTRUCTION IS COMMON IN DOUBLE ACTING ENGINES AND LARGE SLOW SPEED SINGLE ACTING ENGINES. MOST MEDIUM AND SMALL SIZE ENGINES USE TRUNK PISTONS. RESULTING SIDE THRUST CAUSES THE PISTON TO PRESS AGAINST THE CYLINDER WALL, FIRST ON ONE SIDE, THEN ON THE OTHER. 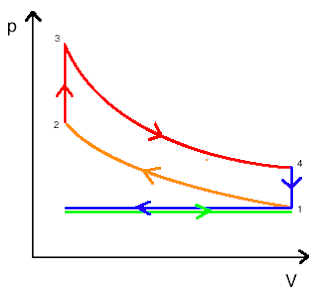 AT THE TOP OF STROKE, WHEN THE GAS PRESSURE IS GREATEST, SIDE THRUST IS NEGLIGIBLE (DUE TO SMALL CONNECTING ROD ANGLE). SO MOST OF WEAR TAKES PLACE AT THE MIDDLE OF STROKE. MAKING PISTON SKIRT INCREASES THRUST-BEARING AREA, AND HENCE REDUCES WEAR. IN MEDIUM AND SMALL SIZE ENGINES, DUE TO LOWER GAS PRESSURE; UNITS’ SIDE PRESSURE IS SO SMALL THAT NEITHER PISTON NOR LINER WEARS MUCH. IN CROSSHEAD ENGINES, CROSSHEAD TAKES THE SIDE THRUST, WHICH WILL BE HIGH IN LARGE ENGINES. SO, CROSSHEAD ENGINES HAVE THE FOLLOWING ADVANTAGES: EASIER LUBRICATION, REDUCED LINER WEAR, UNIFORMLY DISTRIBUTED CLEARANCE AROUND PISTON, SIMPLER PISTON CONSTRUCTION BECAUSE THE ‘GUDGEON PIN’ AND ITS BEARING ARE ELIMINATED. THE VACUUM IS CREATED WHEN THE PISTON MOVES AWAY FROM THE COMBUSTION SPACE DRAWS IN THE FRESH CHARGE. THE CHARGE IS ADMITTED INTO THE CYLINDER AT A HIGHER THAN ATMOSPHERIC PRESSURE. THIS HIGH PRESSURE IS PRODUCED BY A PUMP OR BLOWER OR EXHAUST GAS TURBOCHARGER. SLOW SPEED ENGINES: 100 TO 150 R.P.M. MEDIUM SPEED ENGINES: 300 TO 1000 R.P.M. HIGH SPEED ENGINES: MORE THAN 1000 R.P.M. IF BORE/STROKE IS ABOUT ONE, CRANKSHAFT WEB DIMENSIONS BECOME LESS COMPARED TO JOURNAL AND CRANKPIN. GENERALLY OVER SQUARE ENGINES ARE NOT USED. 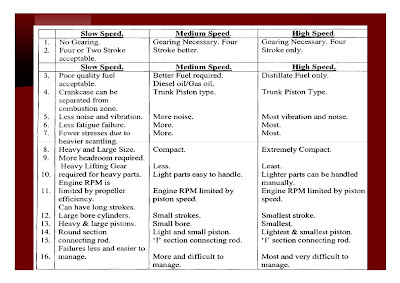 GENERALLY, ENGINES HAVE STROKE/BORE >1. THIS GIVES CRANKSHAFTS OF GOOD STRENGTH. MOST COMMON RATIO IS STROKE/BORE = 2. 0: 2.2. TO HAVE BETTER PROPELLER EFFICIENCY AND BETTER COMBUSTION EVEN WITH LOWER GRADE FUELS, LOWER R.P.M. ENGINES WITH LONGER STROKES ARE GAINING POPULARITY. 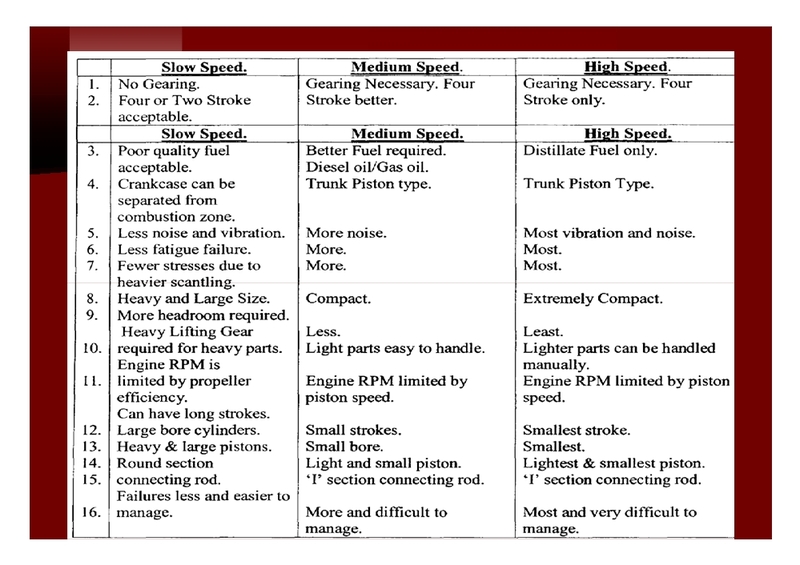 THESE ENGINES HAVE STROKE/BORE RATIO = 3. THE DIESEL ENGINES FIND THE FOLLOWING APPLICATION ON BOARD MERCHANT SHIPS. DIESEL ENGINE USES FUEL COSTING VERY LESS AS COMPARED TO OTHER ENGINES. DIESEL ENGINE IS NOT ONLY EFFICIENT WHEN IT IS FULLY LOADED, BUT ALSO WHEN IT IS PARTLY LOADED. DIESEL FUEL IS NON-EXPLOSIVE AND LESS FLAMMABLE AT NORMAL TEMPERATURES AND PRESSURES. IT REQUIRES SPECIAL EFFORT TO MAKE IT START TO BURN. THIS FEATURE MAKES IT VERY ATTRACTIVE IN THE MARINE TRADE, BECAUSE IT WOULD BE MUCH SAFER CARRYING DIESEL OIL ON BOARD SHIPS. DIESEL EXHAUST GASES ARE LESS POISONOUS THAN OTHER ENGINES, BECAUSE THEY CONTAIN LESS CARBON MONOXIDE. DIESEL ENGINES DO NOT REQUIRE BATTERY OR MAGNETO RUNNING THEM. 6. MORE POWER CAN BE PRODUCED DUE TO MORE COMPRESSION ALLOWED. 7. DIESEL ENGINE IS MORE ROBUST AND STRONGER. STAGES OF GROWTH, THE EFFICIENCY IS HIGH. DIESEL ENGINE PLANTS HAVE LESS WEIGHT AND SPACE PER UNIT POWER. IT IS THEREFORE WELL SUITED TO PORTABLE AND MOBILE INSTALLATIONS. A DIESEL ENGINE REQUIRES VERY LESS WATER IN CONTRAST TO STEAM PLANTS. A COLD DIESEL ENGINE CAN BE STARTED INSTANTLY AND MADE TO CARRY ITS FULL LOAD IN FEW MINUTES. IT IS THEREFORE IDEAL FOR SUPPLYING EMERGENCY POWER. A DIESEL ENGINE CAN BE MADE TO RUN AT FULL POWER IN EITHER DIRECTION. NO FIRE ROOM FORCE IS NEEDED. THERE ARE NO ASHES TO BE DISPOSED OF, NO NOISY AND DUSTY COAL HANDLING AND PULVERISING EQUIPMENT TO MAINTAIN, NO SMOKE, AND NOISE CAN BE EASILY ELIMINATED. DUE TO ABOVE MENTIONED REASONS, DIESEL ENGINES ARE QUITE POPULAR ON BOARD SHIPS. THESE REASONS CAN VERY WELL BE REGARDED AS THE ADVANTAGES OF DIESEL ENGINES OVER OTHER PRIME MOVERS SUCH AS GASOLINE ENGINES, GAS TURBINES, STEAM ENGINES, STEAM TURBINES AND HYDRAULIC TURBINES. DIESEL ENGINES, BECAUSE OF THE HIGHER PRESSURES AT WHICH, THEY WORK, REQUIRE STURDIER CONSTRUCTION, BETTER MATERIALS AND CLOSER FITS THAN GASOLINE ENGINES. THEREFORE, THEY COST MORE TO BUILD. BECAUSE OF STURDIER CONSTRUCTION, WEIGHT PER POWER IS MORE THAN GASOLINE ENGINES. A DIESEL ENGINE REQUIRES MORE ATTENTION THAN AN ELECTRIC MOTOR RUNNING ON PURCHASED CURRENT. IT ALSO REQUIRES MORE ATTENTION PER UNIT OF POWER PRODUCED THAN A LARGE STEAM TURBINE. OIL USED IN DIESEL ENGINES IS COSTLIER THAN COAL. HENCE, STEAM POWER PLANTS USING COAL AS FUEL ARE CHEAPER IN OPERATION.